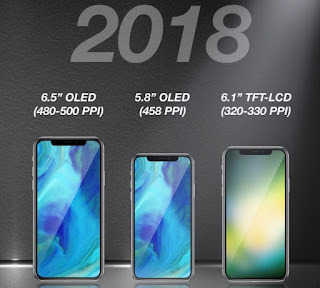 Apple expects there LCD model iPhone to make up the majority of sales in its lineup to be released this fall, a greater proportion than analysts had anticipated, and plans to use the displays in 2019, as well, reports The Wall Street Journal. This mostly lines up with (former) KGI Securities analyst Ming-Chi Kuo’s prediction that the 2018 iPhones will ship in 5.8- and 6.5-inch sizes in OLED, with a lower-priced ($700-$800) 6.1-inch device coming, as well. He believes the latter will have a single rear camera, and an aluminum frame rather than stainless steel. Kuo Kuo says the lower priced smartphone will lack 3D touch, and have 3GB of RAM, as compared to 4GB in the OLED models. Kuo forecasts that Apple will ship between 80 and 90 million phones after they launch. Of those, he anticipates about 50% to be the 6.1-inch LED model.